Despite its name, Dumfries House lies not near the town of Dumfries but only a few miles from Mauchline. The building, designed by the renowned Adam brothers, was commissioned by William Dalrymple, 5th Earl of Dumfries, and built between 1754 and 1759. Housing a unique collection of Chippendale furniture, it is an 18thc. time-capsule, the principal rooms remaining virtually unchanged for 250 years. 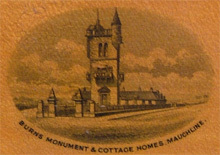 The last family member to reside there, the Dowager Marchioness of Bute, died in 1993. Since 2008, The Great Steward of Scotland’s Dumfries House Trust, which now owns the estate, has welcomed many visitors to view the property. There are several flights of steps within Dumfries House, thus access is limited for wheel-chair users and those with reduced mobility. The tour is mostly on the first floor, with a short time spent on the second floor. Visitors with reduced mobility may wish to remain on the first floor, while the tour continues to the upper level. We intend to gather about 11 a.m. at the Parking Area, only 5 minutes walk from the House, before joining the Guided Tour ( lasting approx. one hour ) at 11.30 a.m.
After lunch we shall meet in Mauchline at Burns House Museum about 2.30 p.m., to view the latest Mauchline Ware display opposite the Museum in Nanse Tinnock’s , including Barry Kottler’s South African pieces, mentioned in the August 2009 Journal. Stanley Sarsfield , a member of East Ayrshire Council’s Museum staff, will be present to enlighten us on certain items from this collection. Detailed directions on how to locate Dumfries House and where to park in Mauchline will be sent out in August. An application form for this visit was enclosed with the recent Journal. We are planning to hold our next Convention from Thursday 7th April to Sunday 10th April 2011 at the Lincoln Hotel, Lincoln which is situated across the road from the magnificent Cathedral. Full details together with a Booking Form will be included in the August 2010 Journal.